Many folks know the games as Land Air Sea Warfare, other as Real-Time Strategy. Anyway you paint it, it’s a game that you don’t just run and jump. These games take a lot of strategy and planning. Usually, to play successfully, you have to be locked to your computer screen for hours. Now, on the iPad there is options to play when you have time, on the go. And, one particular properly named app, Land Air Sea Warfare HD, gives the player the high def view of their game board to make the play even better. The graphics throughout the game bring the level of game play up a bit so as you go it get harder and harder to put your iPad down. We don’t recommend you play the game in meetings, like several folks in our offices were doing last week, but since it is a strategy game you wont be jumping around your chair to over a bouncy cute creature that wants your golden coins. We do recommend turning off the background music though before going into the meeting room. 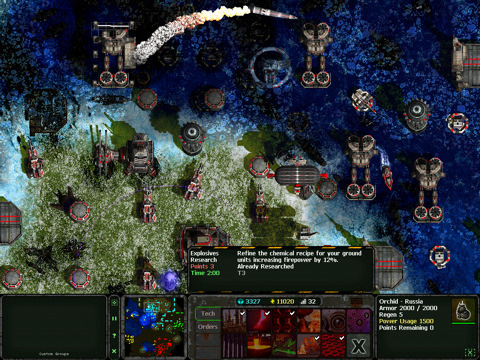 In the game, you control tanks, aircrafts and ships that can be divided into groups. That is, after you get your factories up to speed to build them. Which means you really should have gun turrets in place first to protect those factories. All on a map grid that the game creates randomly for every player so no two games are ever alike. 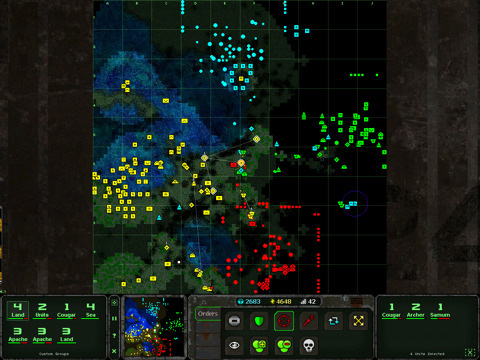 By the nature of a strategy war game, this isn’t for all iPad owners. But those who enjoy doing more than moving tank chess pieces about the screen where you are having to think through your next 20 moves, this might be just the challenge you seek.